Like the rest of the world, I was so sad to hear about the passing of the brilliant and legendary Maya Angelou. I truly feel we have lost one of the most inspiring and incredible people on this earth. My whole life, as a writer and activist, I was always in awe of her, and she was on top of my interview wish list. Back in 2008, I submitted the first interview request to her office to be considered amongst her busy schedule. After almost a year passed, and I received the email informing me of the date and time she would be able to talk to me, I was grateful and thrilled and, I must admit, a little bit nervous. I have interviewed my share of renowned figures, but of course Maya Angelou is a cultural icon and one of the most influential and admired thought leaders of our time. Yet I shouldn't have been nervous at all, because as it turned out she could not have been more warm, loving, humble and gracious both times I had the honor of interviewing her. Dr. Angelou asked me many personal questions about my work and my life, and treated me from the start like an old friend. I was immediately entranced by her beautiful, luminous spirit which beamed through the phone, and also by her distinctive, unforgettable, commanding voice. 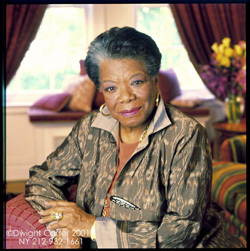 Maya Angelou is the one person whose interviews I did not have to slow down to transcribe -- she talked with such resounding, measured magnificence, as if every melodious word was a treasured gift. I think so. I think we are making it very clear to people, whether they want to hear it or not, or whether they would like to think of this as some fluke of history -- wrong, wrong. People are saying, 'This is what I will stand for. And I will not stand for any less than this.' It's amazing. We are growing up! We are growing up out of the idiocies -- racism and sexism and ageism and all those ignorances. When I interviewed Dr. Angelou the second time, last year, about the inspiring book she wrote about her mother's important influence on her life, Mom & Me & Mom, I started our interview by saying how happy I was to be able to speak to her again, to which she sweetly offered, "Thank you. It 's my delight." While Dr. Angelou is an impressive and accomplished figure with three Grammys, more than 30 honorary degrees and the Presidential Medal of Freedom, she had an incredibly endearing way of making everyone she encountered feel equal and special. She even took a personal interest in my two daughters, Lotus and Jazmin, asking me their ages (12 and 15 at the time) and insisting that I read a certain poem, Portrait of a Girl with a Comic Book by Phyllis McGinley as soon as we hung up the phone. She urged, "Please. You can get it off the Internet when we hang up. You will love it. It says, 'Thirteen is no age at all.' Please look at it. You will see your daughters. You will see the 15-year-old and the 12-year-old. You will see them both. When I read it, I fortunately read it when my son was young, and it meant a lot to me in raising my son." So of course I not only looked up the poem as soon as we got off the phone but felt compelled to post it online so I could link to it in our interview. She ended our conversation by thanking me and saying "God Bless you and the girls." In truth, the most fitting tribute we can offer to Maya Angelou's legacy is to deeply reflect upon and incorporate the important, timeless values she was a messenger for -- love, peace, empowerment and tolerance -- into how we live our lives and conduct ourselves in the world. We may encounter many defeats, but we must not be defeated. It may even be necessary to encounter the defeat, so that we can know who we are. So that we can see, 'Oh, that happened, and I rose. I did get knocked down flat in front of the whole world, and I rose. I didn't run away; I rose right where I'd been knocked down.' That's how you get to know yourself. You say, 'Hmm... I can get up! I have so much courage in me that I have the effrontery, the incredible gall to stand up.' That's it. That's how you get to know who you are. What follows are some of my favorite quotes from my interviews with Maya Angelou. Well, I had a fabulous grandmother. And my mother. I have some sister friends. They have influenced and strengthened my life. When I want to think about what would be the right thing to do, the fair thing to do, the wise thing to do, I can just think of my grandmother. I can always hear her say, 'Now sister, you know what's right. Just do right!' All of us know, not what is expedient, not what is going to make us popular, not what the policy is... but in truth each of us knows what is the right thing to do. And that's how I am guided. We need to be seen, all over the place. We need to be seen as well as heard. It's not sufficient to say, 'Well, we are here, and we deserve.' If we really think that the majority of women in the world are also always in the kitchen and in the kindergarten and in the places just to look after the young and men, then we do ourselves and everybody a disservice. Because women offer so much more than it would seem we offer. It would seem we offer kindness and the chance to be cared for and nursed in more ways than just medical. And I think that the whole country needs to know that women are much smarter -- we're more than that. We're that and more than that. Ignorance, of course, but mostly polarization. You see, it's a long time arranging this sort of condition. And it will not be over in one term, or even two. But we are on the right road. If you have a person enslaved, the first thing you must do is to convince yourself that the person is subhuman and won't mind the enslavement. The second thing you must do is convince your allies that the person is subhuman, so that you have some support. But the third and the unkindest cut of all is to convince that person that he or she is not quite a first-class citizen. When the complete job has been done, the initiator can go back years later and ask, 'Why don't you people like yourselves more?' You see? It's been true for women, it's been true for immigrants, it's been true for Asians, it's been true for Spanish-speaking people. So now we have to undo. And it will be no small matter, but we can undo it. We can learn to see each other and see ourselves in each other and recognize that human beings are more alike than we are unalike. I would encourage us to try our best to develop courage. It's the most important of all the virtues, because without courage, you can't practice any other virtue consistently. You can be anything erratically -- kind, fair, true, generous, all that. But to be that thing time after time, you need courage. We need to develop courage, and we need to develop it in small ways first. Because we wouldn't go and say, 'I'll pick up this 100-pound weight' without knowing our capacity. So we need to say, 'Oh, I'll start by picking up a five-pound weight, then a 10-pound weight, then a 25-pound, and sooner or later I'll be able to pick up a 100-pound weight.' And I think that's true with courage. You develop a little courage, so that if you decide, 'I will not stay in rooms where women are belittled; I will not stay in company where races, no matter who they are, are belittled; I will not take it; I will not sit around and accept dehumanizing other human beings' -- if you decide to do that in small ways, and you continue to do it -- finally you realize you've got so much courage. Imagine it -- you've got so much courage that people want to be around you. They get a feeling that they will be protected in your company. It reminds us that we are not just flesh and blood, and that our hungers are not going to be set aside as just flesh and blood. That indeed we have souls. And if a person is religious, I think it's good, it helps you a bit. But if you're not, at least you can have the sense that there is a condition inside you which looks at the stars with amazement and awe. That listens to water with a river flowing, or water falling in rain and is lifted up by that, and listens to wonderful musicians, listens to maybe Duke Ellington or Frank Sinatra or Odetta and Mary J. Blige and thinks,Yes, hmm, all right now. My soul has been washed. I feel better, I feel stronger. Listen to some good poetry. You see? It keeps us from thinking we are only what our blatant appetites describe us as. My mother was always on my side, and that really liberated me. Because when teachers or people in authority put me down or in one way or another tried to make me feel less than equal to what they thought I should be, my mother was on my side. It was amazing. And I realized that that's what allowed me to become the parent I did become. I have been on my son's side... I realized that [my mother] really was an incredible supporter, and I don't think that you could have anybody stronger -- I mean, if you were the president of the United States or the Queen of England, you couldn't have a person who would be more protective than my mother was for me. Which meant really that I could dare to do all sorts of things. And I could even dare to be somebody. I have a feeling that I make a very good friend, and I'm a good mother and a good sister and a good citizen. I am involved in life itself -- all of it. And I have a lot of energy and a lot of nerve. And I find that I make friends with women who are very much like me. They may be black or white or Asian or Spanish speaking, they may be young or old or pretty or plain, but if they also have a sense of humor, a sense of good humor and pizazz and dare to think that this is their life and they can take some chances with it, then it's very likely that we'll make friends. And over time we'll talk about matters of pith and moment. Look what you've already come through! Don't deny it. You've already come through some things, which are very painful. If you've been alive until you're 35, you have gone through some pain. It cost you something. And you've come through it. So at least look at that. Have a sense to look at yourself and say, 'Well, wait a minute. I'm stronger than I thought I was.' We need to not be in denial about what we've done, what we've come through. It will help us if we all do that. I wish that we could look into each other's faces, into each other's eyes, and see our own selves. I hope that the children have not been so scarred by their upbringing that they only think fear when they see someone else who looks separate from them. Note: this article originally appeared at The Huffington Post. Portions of the above originally appeared in Daring to Be Ourselves: Influential Women Share Insights on Courage, Happiness and Finding Your Own Voice and What Will it Take to Make a Woman President? Conversations About Women, Leadership & Power by Marianne Schnall.